YouthPlaces began small, as a safe place for children to go after school when few programs of the sort were available. Now, young people go there to find tutoring, mentoring, sports leagues, leadership development programs, and creative writing opportunities. In 1997, there was a problem in Western Pennsylvania: Children were in need of a safe place to go after school and few programs were available for them to join. The Youth Crime Prevention Council, a group of civic and community leaders helping to combat violence among young people in the Pittsburgh area, was called on to remedy the situation. It devised a plan in the form of YouthPlaces. They started small, focusing on sports-based programs held at five different sites, in five different communities serving 500 young people in Pittsburgh. Twenty years later, the organization, which is now primarily based on the Northside, has expanded to 10 sites and serves over a thousand children between the ages of 12 and 18 in both the City of Pittsburgh and Allegheny County. At YouthPlaces, young people can find tutoring, mentoring, a host of sports leagues and leadership development programs. Due to its partnership with entities such as the Citizen Science Lab, the Manchester Craftsmen’s Guild and YOGAMOTIF, the organization provides a host of different activities for young people that many mainstream organizations do not. “I think that we’ve been able to close the opportunity and access gap through the work we do,” James said. She credits the organization for its commitment to hiring staff and partnering with organizations from within the communities where sites are based. 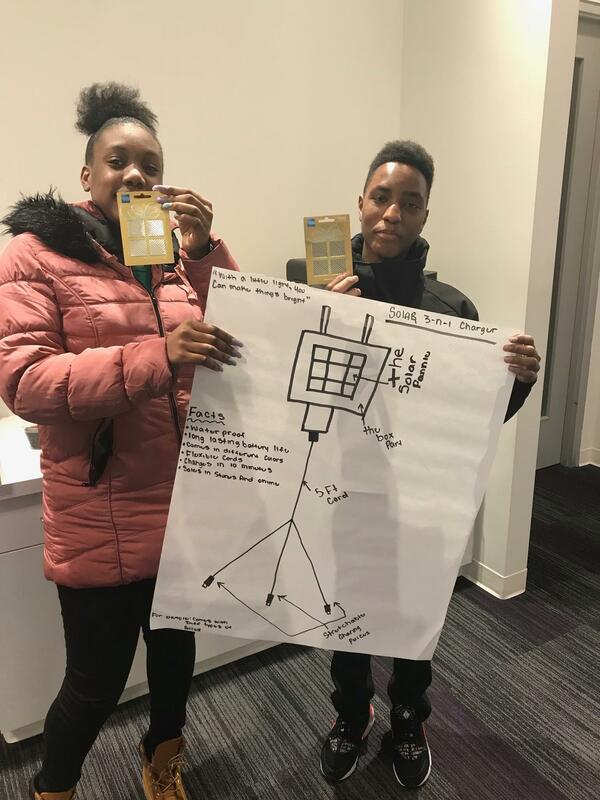 The winning team from a YouthPlaces Shark Tank competition show off their design pitch for a solar-powered smartphone charger. Photo courtesy of YouthPlaces. “When I started they didn’t know me and I didn’t know them, but getting to know them and getting to the point where they trust me and are actually happy to see me everyday really stands out,” she said. During her term of service, Reifman is determined to incorporate writing into the YouthPlaces mission to empower young people in the form of a monthly newsletter. The newsletter will accept submissions on the fifth of each month and is open to a wide variety of writing styles, from poetry to personal essays. Submissions must be no more than one page in length and cannot include foul language. An avid writer as a child, the 38-year-old said it was important to her to give the kids she works with an additional outlet. “My vision for the newsletter is just to have more young people participate because YouthPlaces is supposed to be for the youth and I want them to have a platform,” Reifman said. After over two decades and in an ever changing world for nonprofits, YouthPlaces has managed to forge a lasting impact in the communities it serves. James believes that what keeps kids coming back and bringing their friends is the relationships they form there. More information about YouthPlaces opportunities can be found on the programs’s website at https://youthplaces.org/. Submissions for the monthly newsletter can be sent to ereifman@youthplaces.org.